Solo cyclists Gillian and Craig joined my dynamic duo for the ride across the Tay to Carnoustie. 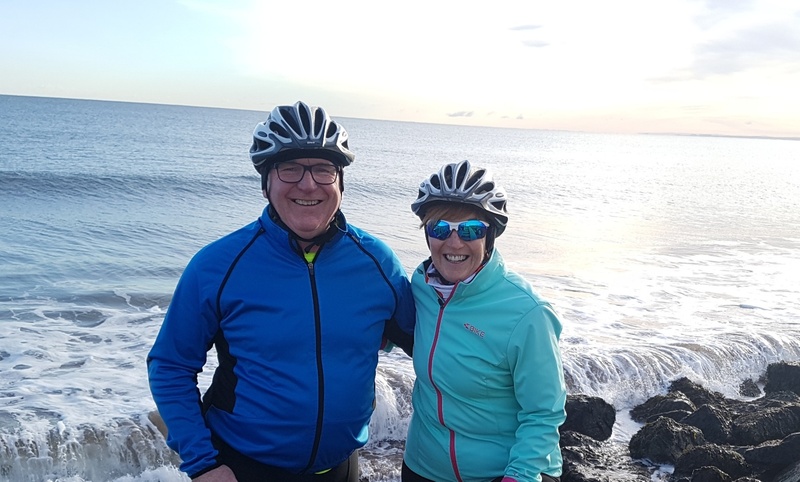 The “old git” and the “old gal” had invited good solo cycling friends Gillian and Craig to Matildas Rest for a weekend of fun! 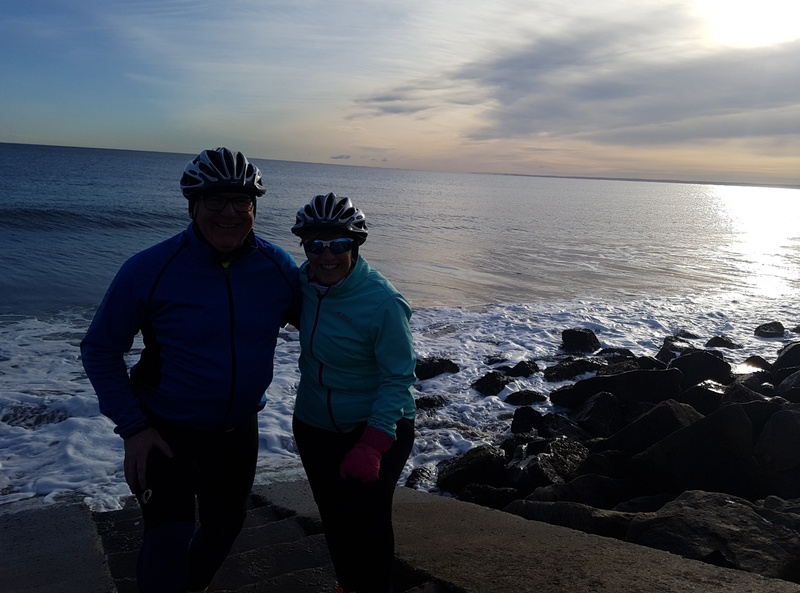 The plan was to head into Perth on the Saturday for Scotland’s biggest Christmas lights switch-on party before heading for a meal, back home for some zzzzs, then a planned gentle ride to blow away the cobwebs on the Sunday. And it all worked a treat! I was left behind to entertain the two shiny sleek sporty lightweight racing bikes belonging to our visitors, while the cycling crews headed by bus into Perth city centre. 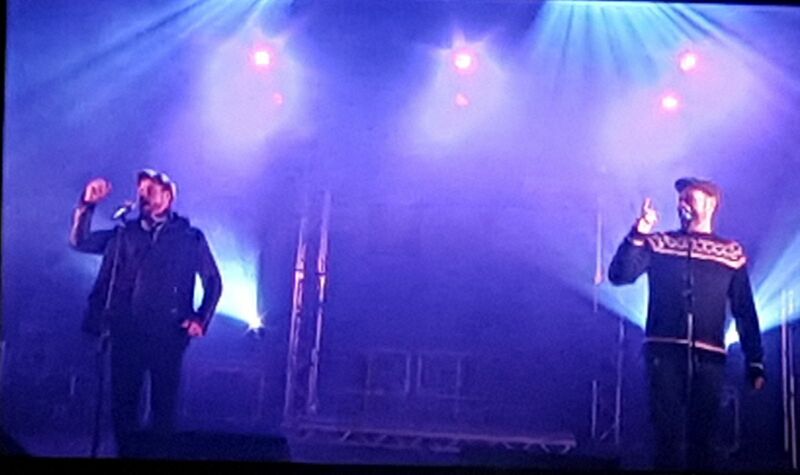 The cyclists all enjoying themselves watching acts like Alesha Dixon at the Perth Christmas Lights concert. 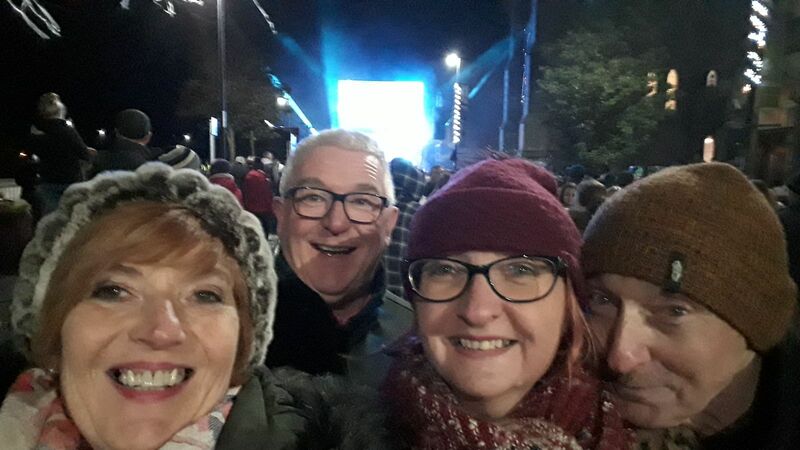 And the city certainly lived up to its billing as “Scotland’s Christmas capital” as it hosted a massive party, with an estimated 100,000 revellers flocking into the festivities. Before the big light switch on and fireworks there was the small matter of visiting a gin and chocolate festival on the High Street. Now as you may now my dynamic crew have a bit of a thing for Scottish artisan gins – and Gillian and Craig have a bit of history in this area too – so it was a perfect match! The crew’s eagerly sampled and compared quite a few of the brands on display! It seems that one of the best was a brand new gin from Twin River Distillery based in Banchory, near where the “old gal” was brought up. The Twin Rivers refers to the Dee and the Don and the distillery is one of only three in Scotland to make its own grain neutral spirit, the base for craft spirits, to ensure a completely authentic gin offering. Result – bottle purchased for the gin cupboard at Matildas Rest! Boyslife blasted out the hits from Boyzone and Westlife. Apart from the gin and chocolate stalls, the city was packed with fairground rides, ice sculptures, food stalls and street performers. 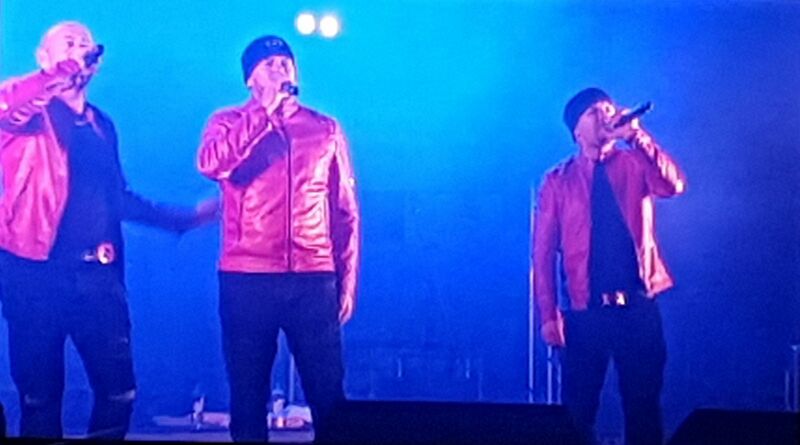 After squeezing our way past all that entertainment the cycling crews made their way to the main stage on Tay Street where an outdoor concert was a major feature to the switch-on celebrations with Mud, Boyzlife and East 17 providing the musical entertainment. 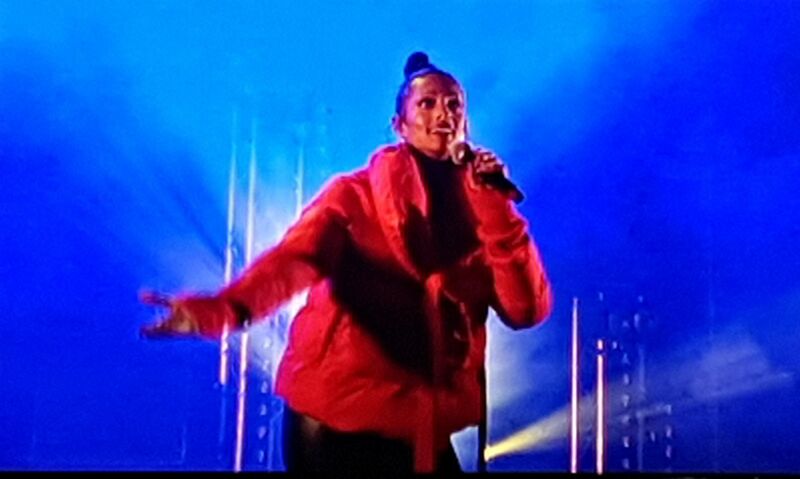 Alesha Dixon was the headline act – and did not disappoint. Topping the bill was singer Alesha Dixon, best known for Strictly Come Dancing and her role as judge on Britain’s Got Talent. She vowed the crowds with an entertaining set. Congratulations should go to Perth and Kinross Council and Perth City Centre for putting on such a fantastic and well organised day. As the temperature dropped my dynamic crew and their friends retired to enjoy a Spanish tapas themed meal at Sante – where I am told the paella was fabulous! After a late night bus trip back to Matildas Rest – everyone was soon asleep dreaming of our pedal the next day! Beautiful sunny skies met the “old gal” and the “old git” as they got ready to roll! 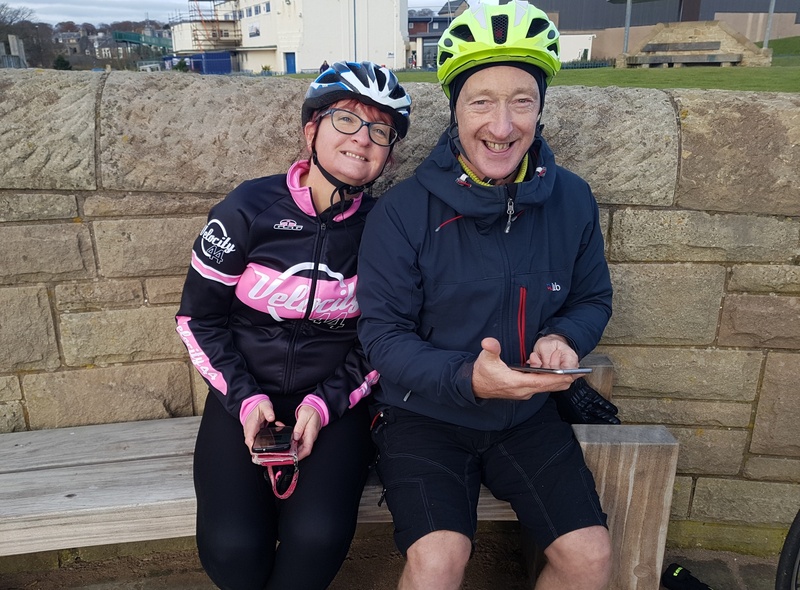 The bike crews may have been hoping for a long lie but the “old git” had everyone up sharpish – while the “old gal” offered a hearty breakfast for fuel. Fortunately the weather forecast had come up trump with the promised dry sunny day, so it was off in Matilda Transport to the Tay Bridge car park. 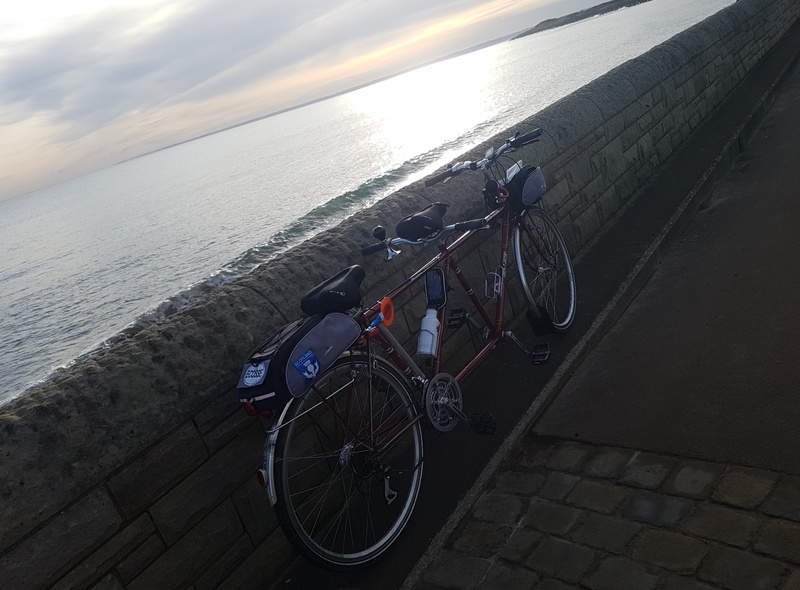 The route was going to be one of my favourites – a near 13 mile ride across the bridge and onto Sustrans Scotland NCR1 to Carnoustie. Craig and Gillian took a selfie which was photobombed by my dynamic crew! As the crews unpacked in the car park opposite Dundee the view across the Tay was clear blue skies which offered the perfect backdrop for the inevitable series of selfie photos – including one where Craig and Gillian were effectively photobombed by my dynamic crew! And then we were ready to roll! The first part of the trip was crossing the Tay Bridge – which carries the A92 across the Firth of Tay, and is one of the longest road bridges in Europe. Opened in 1966, it celebrated its 50th anniversary last year – making it nearly as old as me, but not quite! Intriguingly the cycle path on the bridge sits in in the middle of the two carriageways for cars, unlike most bridges where the path runs at the side of the bridge. This was a bit odd to begin, creating a feeling of being boxed in and it was slightly disconcerting having the cars driving past at such speed and in close proximity – albeit behind crash barriers. But it did actually feel very safe and we soon got into our stride and as you will see from this Strava segment called “Hop the Tay” my crew worked up a good speed, averaging 15.3 mph over the 1.3 mile stretch with a time of 5 mins 16 secs – smashing their own previous record of 6 mins 30 secs. 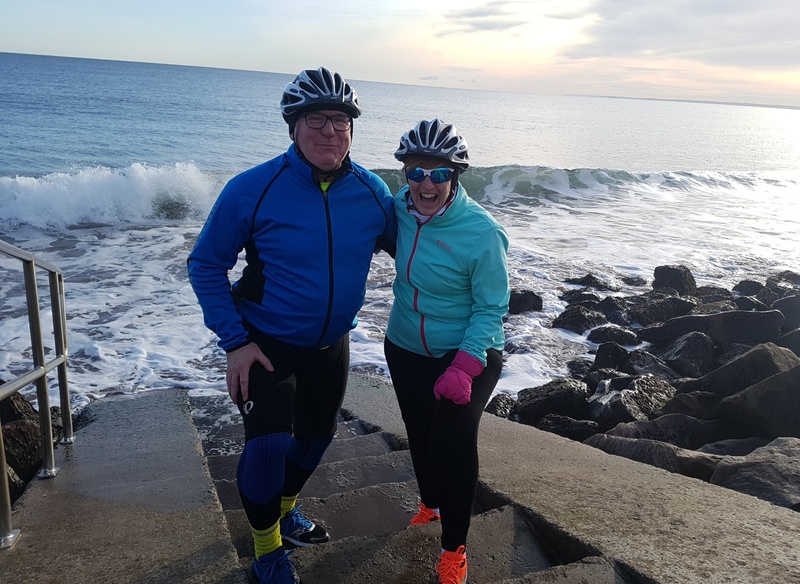 Amazingly the segment also shows up any friends who have done the same route and the “old git” was surprised to see good tandem friends John and Jane – of Travelling in Tandem blog fame – pop up. They recorded a (slower!) time of 6 mins and 02 seconds when they crossed the Tay Bridge in the same direction back in September 2015 during one of their long distance rides from John O Groats. 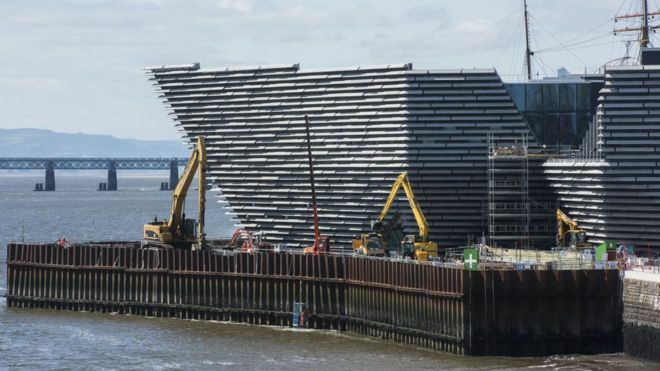 As we got to the end of the bridge my dynamic crew got a great view of the huge new V&A Museum of Design Dundee which is taking shape as it emerges from the construction site – with the building designed to look like ships. When it opens in 2018 it will be an international centre of design for Scotland – the first ever design museum to be built in the UK outside London. Off the bridge and we followed the well signposted NCR1 through the Dundee port area. It really is a great cycle path, and very flat, which made the “old gal” smile! And because it is a dedicated path – away from roads – it is very popular with cyclists and dog walkers, which makes for lots of sociable greetings along the way! 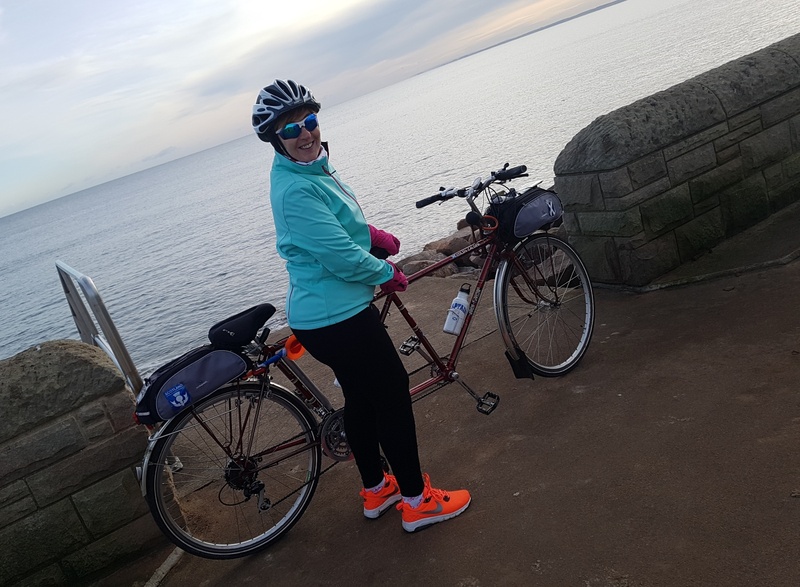 As we tandemed round the bay the charming old fishing town of Broughty Ferry came in to view and with little effort we cycled past the castle and continued along a stretch which hugged the Blue Flag beach. With the sun out, it was a joy to be tandeming in such a lovely area on such a beautiful day. The route continues to Monifieth where a new stretch of path heads over Barry Links, past a very large Ministry of Defence area on the right known as the Barry Buddon Training Centre. This has high security fencing along its perimeter and rather ominously every 100 yards or so there are warnings signs telling you to keep out as this is a live military firing area! The spot selected for the picnic was right at the beach and had a wonderful view across the bay. Not surprisingly the “old gal” ordered the “old git” to pay heed to the signs and not to veer off course! Pedalling along on the NCR1 we soon came to our picnic destination of Carnoustie – home to the famous championship golf course which was looking at its spectacular best in the sunshine – with lots of golfers out on its links. 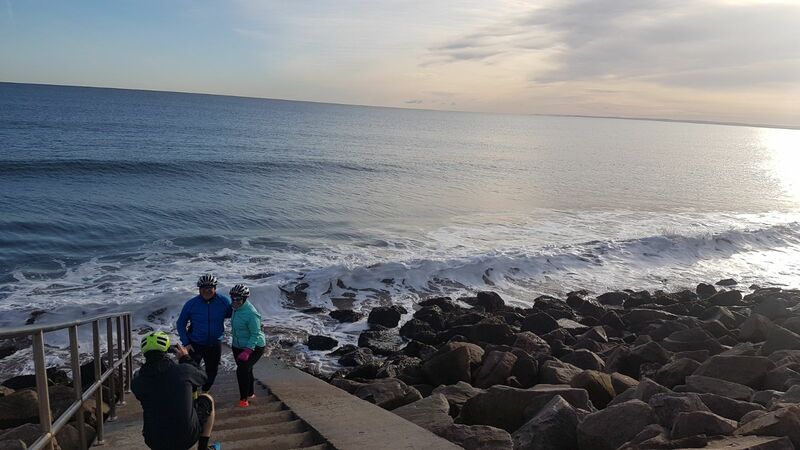 Along with Gillian and Craig – who had enjoyed their first time on the route – we selected a brilliant location for our picnic right at the seafront with a fabulous view across the bay. There were some steps at a slipway which providing an interesting photo opportunity for my dynamic crew, with big waves crashing in behind them! There were some steps at a slipway which provided an interesting backdrop of big waves! Gillian took a picture of Craig taking a photo of my dynamic crew trying not to get wet! 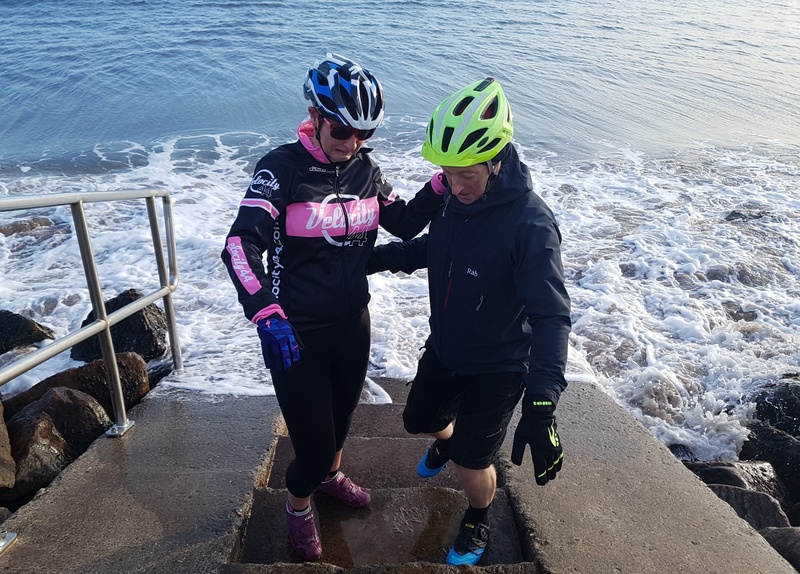 Naturally Craig and Gillian had to have a shot at beating the waves on the steps – although they looked a bit less comfortable on the “old git’s” shout of “It’s behind you!” as one massive wave crashed in and crept up the steps! I guess it must be his sense of humour! It’s behind you! Gillian and Craig looking a little unsure as the waves rush in! After playing dodge the waves my crew were ready for their picnic which today offered a menu of smoked salmon croissants with chilly cream cheese and some fresh seasonal fruit. Another wonderful picnic with another wonderful vista. Gillian and Craig checking their performance on their phones after the picnic! The “old gal” fortified by her picnic ready for the return trip back to the Tay Bridge. 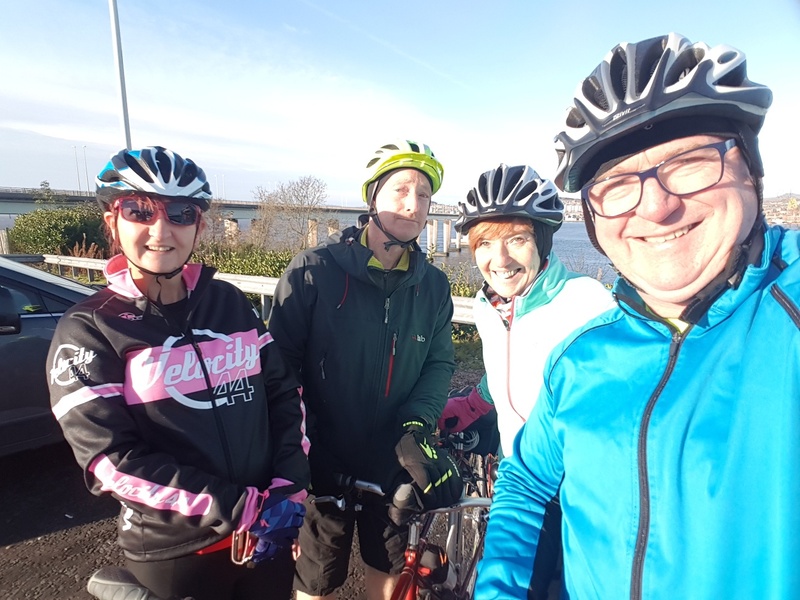 Fortified by their picnic lunch it was time to head back on the return trip 13 mile trip back to the Tay Bridge so we would all be back before it started to get dark. As the sun began to drop in the sky so did the temperature – and a check later revealed that the promised 6C was hit … but it masked a “feels like” temperature of minus 1! So it was starting to get a bit chilly around my spokes – and Craig’s legs as he bravely (or perhaps foolhardily!) opted to wear shorts! Here I am showing off my classic lines basking against the sea vista at Carnoustie. Half way back the “old gal” – who was starting to get a bit chilly called a coffee break and we had a warming reviving coffee in the welcoming Glass Pavillion in Broughty Ferry. At this point Gillian and Craig bid my dynamic crew farewell as they could cycle faster on their solo bikes. After tandeming back thru the dockyard, it was time for the return crossing across the Tay Bridge – but firstly we encountered the rather unusual way of accessing the bridge and staying on NCR1 – a lift! But fortunately it is very easy to use. 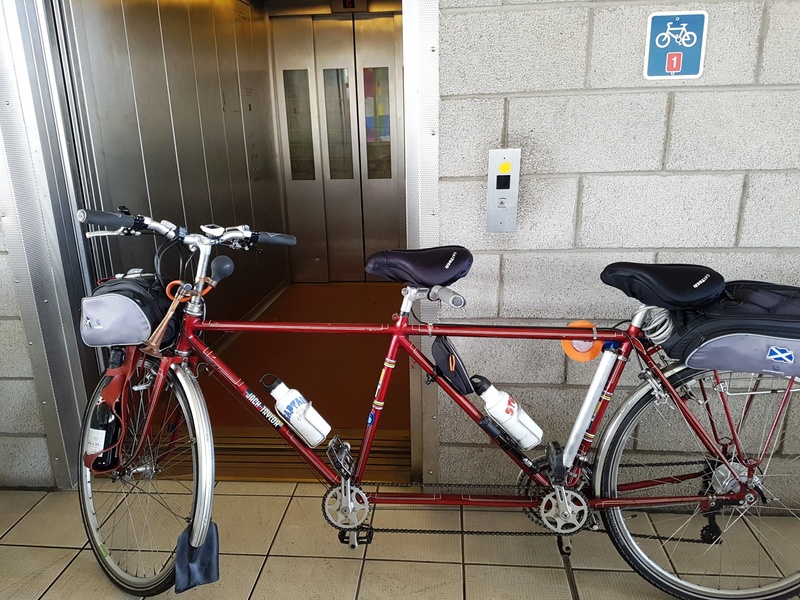 I was thinking that I would have to be lifted unceremoniously into the lift at an awkward angle as there would probably be only room lengthwise for single bikes – but I am delighted to report I could simply be pushed in. Going up! Unusual way of accessing the Tay Bridge on NCR1 – but happily it was a long lift! 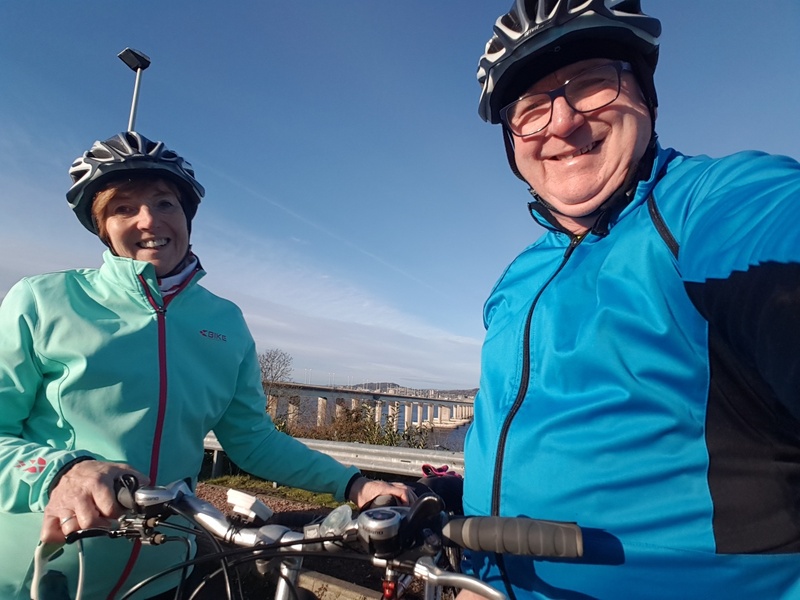 The “old git” was waffling on about breaking another record on the way back across the bridge – but the “old gal” was quick to point out that it was in fact an uphill pedal on the return trip! The “old git” scoffed, but quickly discovered the truth as they pedalled off and were suddenly hit by a head wind! 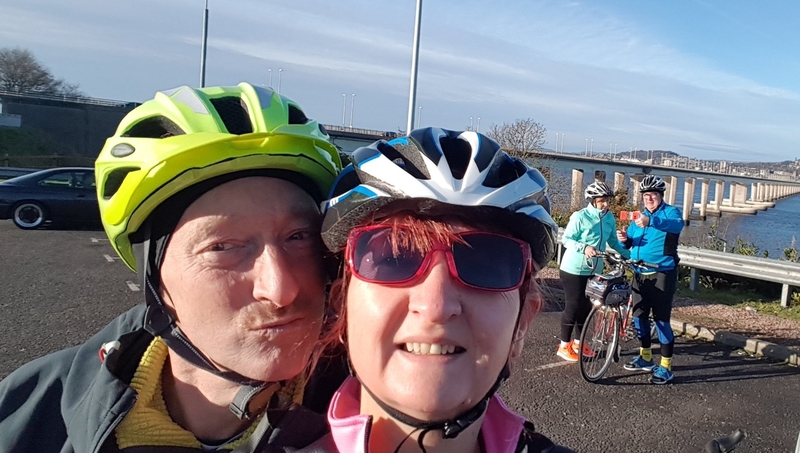 What should have been a quick cycle back across the bridge turned into a bit of a grind – with Strava showing that the return trip – dubbed The Killer Tay Bridge – took nearly four minutes longer than earlier in the day with a time of 8 minutes 58 seconds with the average speed dropping to 9.1 mph. A great sunny – if chilly – day for a tandem ride, especially when the sun started to go down. I was packed back into Matilda Transport and back home in the warmth of Matildas Rest my dynamic crew checked out Strava which officially recorded the ride as being worthy of no less than 26 gongs … 18 personal bests … five 2nd bests … and three 3rd bests. My dynamic crew tandemed a distance of 25.5 miles with a moving time of 2 hours 34 minutes. Average speed was 9.9 mph and the elevation was a fairly flat 505 feet. The maximum speed was 18.3 mph and Team Matilda managed to burn up 1110 calories and produce an average power output of 108 W. As always the route is brought to life in our Relive 3D video – so take a look below. So a great sunny – if chilly – day for a tandem ride – made all the better by cycling with good friends. A grand day out really for Matildas Musings! Aaaaagh spelling mistake! I must pay more attention when I am sat at the keyboard Jane! But yes “mynamic” is a good mix of “my dynamic” … it saves some space you see! Now fixed so thank you eagle eye for spotting it! lol! And yes it was great to be back out on the open road … even it was a bit on the chilly side!